VINYL ON VINYL: Mechanical Romanticism by Iyan De Jesus on November 22, Friday! Mechanical Romanticism by Iyan De Jesus on November 22, Friday! Half-length portraits of nubile women, supple of flesh and noble of face, float against a Daedalian labyrinth of interlocking sprockets, cogs, and axles. Mechanical Romanticism, the first solo exhibition from self-taught artist Iyan De Jesus, softens the metallic edge of steampunk with pliant alabaster skin. Each painting is a pastel-hued post-apocalyptic technofantasy suffused in color. Case in point, Chance Encounters, the largest piece in the exhibition, was born out of a vivid waking dream involving an early-morning visit from a bluebird, rendered here as an automaton. Secreted clocks, their hands indicating the relentless passage of time, represent the artist’s insomnia. Other legible symbols—empty birdhouses and a wind-up mechanism protruding from the woman’s head—push the story forward. 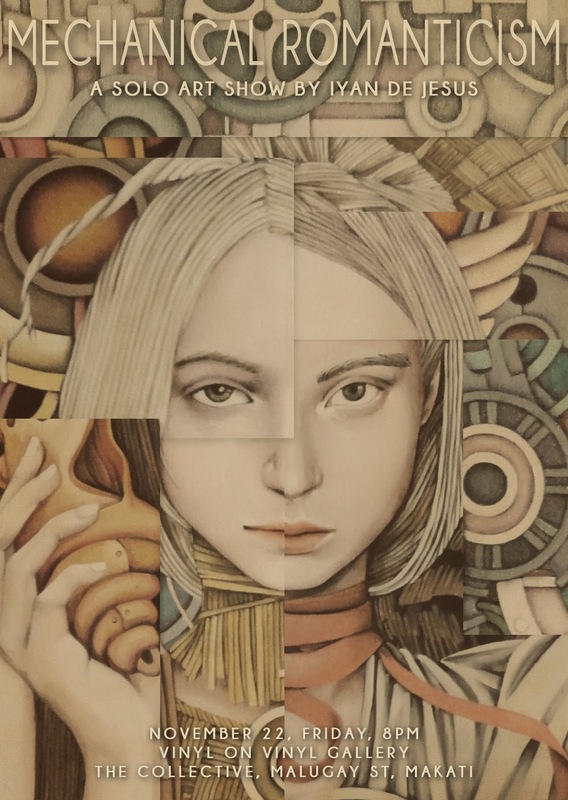 It is obvious that De Jesus suffers from horror vacui, fear of empty space, and she fills every corner of the picture plane with a staggering level of detail. For her, an untouched patch of canvas means that a work is unfinished. Close examination of her portraits will reveal strands of hair that have been rendered individually and meticulous eyebrows groomed by a fine brush. Other visual signatures include the illusion of embossed elements and an aversion to visible brushstrokes. The attention to minutiae, obsession with geometric compositions and patterns, cleanliness of lines, and smoothness of surface hark back to De Jesus’s background in architecture and computer-aided design. Unlike formally trained artists who went from canvas to screen, De Jesus started “painting” with a mouse before she shifted to brushes and glazes. The jump from digital to traditional was a rebellion against the ephemeral nature of bits and bytes, as well as a surrender to the soul’s desire to create something lasting. The result is Mechanical Romanticism, a mesmerizing debut from an artist who has successfully translated her talents from new to old media. Rendezvous with us on November 22, 2013, Friday, at 8pm for the opening of Mechanical Romanticism, a solo art show by Iyan De Jesus.